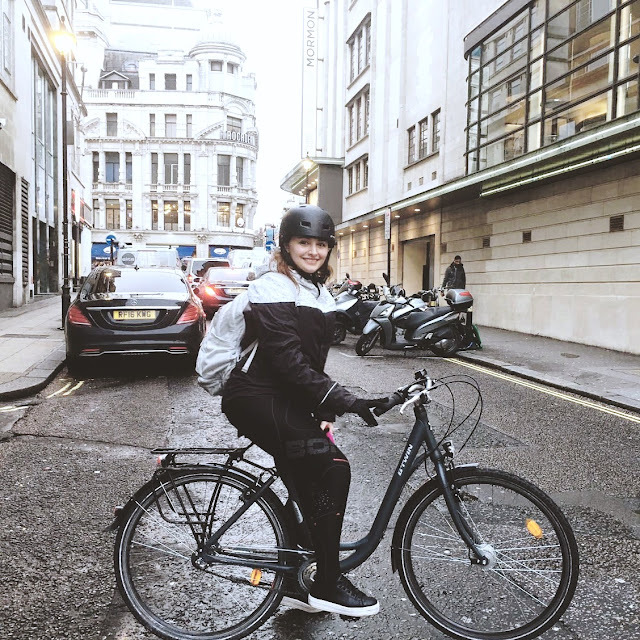 This week's cycling voice comes from a newcomer to cycling, Niusha who is a colleague of mine. She bikes in from Canary Wharf to Central London and is pretty excited about doing more cycling in the future. If you have other routes to suggest to Niusha, feel free to comment. "I've been cycling for three months. Cycling was a big fear in my life after I crashed when I was nine-years old. It happened when I was in Tehran and I was out riding my bike. Back then whenever guys saw a girl out on a bike they used to make fun of her, so my parents didn't like me cycling. I went out on my bike anyway, but a boy threw a ball at me. I lost my balance, fell flat on my face and broke my nose. So overcoming this fear and cycling every day now is a big accomplishment for me. I got back into cycling when a colleague of mine, Justina, told me she had started commuting by bike. As I saw her as similar to me in fitness and lifestyle I thought that I could try it too. At first I was absolutely terrified when I was out on the road, and I freaked out whenever a car passed me, but I persevered. Although it was scary I loved the excitement of cycling on the roads and it gave me an adrenaline rush. It was great to see the gorgeous places in London on my ride from Canary Wharf into the West End. Riding my bike means getting away from my little world. It gives me a positive fighting attitude that I love. For me, cycling is more than just riding a bike, it’s my lifestyle. I also realised that when I get on my bike I seem to forget all my work and home-life stresses. It helps me to completely switch off – I love it! In addition, as my working life doesn’t leave me with much spare time for exercise, commuting by bike keeps me fit. I started cycling in Fall (autumn) and have done so ever since. The weather doesn't matter much to me as I enjoy my ride come rain or shine, but I'm very much looking forward to experiencing rides in the summer. I ride a B'Twin Elops 900 City bike. This was the bike that was recommended to me when I was looking for something to commute with. It's nice and sturdy, if a little heavy, but it's my bike and the first bike I've owned, so that's why I like it. Last week I crashed and hurt my leg while going around a corner. I wasn't fully paying attention and was getting into the music on my headphones. In future I will be more cautious, though at the moment I just want to get back on the horse. In a funny way I feel like I am officially a cyclist now that I have had a crash! When riding I never go out without a water bottle. I always need to drink when cycling as I can work up a sweat during the 50 to 60-minute bike ride. Also I have been challenging myself to ride faster during my commutes, so it's impossible for me to jump on my bike without half a litre of water! My ideal bike ride is going through Richmond Park. I love cycling there. It's absolutely gorgeous and it makes me feel like I’m cycling in a movie scene! I would love to cycle with my partner but he doesn’t have a bike and our timings usually don’t match so 99% of the time I cycle on my own. As I’m a newbie to the cycling world I have yet to find more fascinating cycle routes, but I look forward to exploring new places on two wheels."